We never quite know what we are going to find when we arrive at a new anchorage but our evening at La Paella Restaurant, perched above the beach on Tapana Island, was certainly unexpected. We had heard rumours that it was a great place to visit but looking up from the boat it appeared rather like a dilapidated, deserted shack. We have learnt that in Tonga appearances can be deceptive, so we hailed them on the radio, yes we were told, they could take us for dinner that night. We tied the dingy up at the beach, followed the path up through a garden, with lovely views of the yachts bathing in the pink of another glorious sunset. A pig, a goat and half a dozen chickens ran out to greet us, so far, so Tongan. The moment we entered the restaurant however, we were in a different world, an eccentric, atmospheric, ramshackle world. The smell of wood smoke filled our noses, the bare bones of its timber frame on display, our old house at Ongley flashed through our minds. The furniture was all home made, wonkey and at different heights. An eclectic mix of objects filled every nook and cranny, Basque fabrics decorated the tables and walls, nautical flags hung from the ceiling and Brazillian Samba played in the background. We loved it. 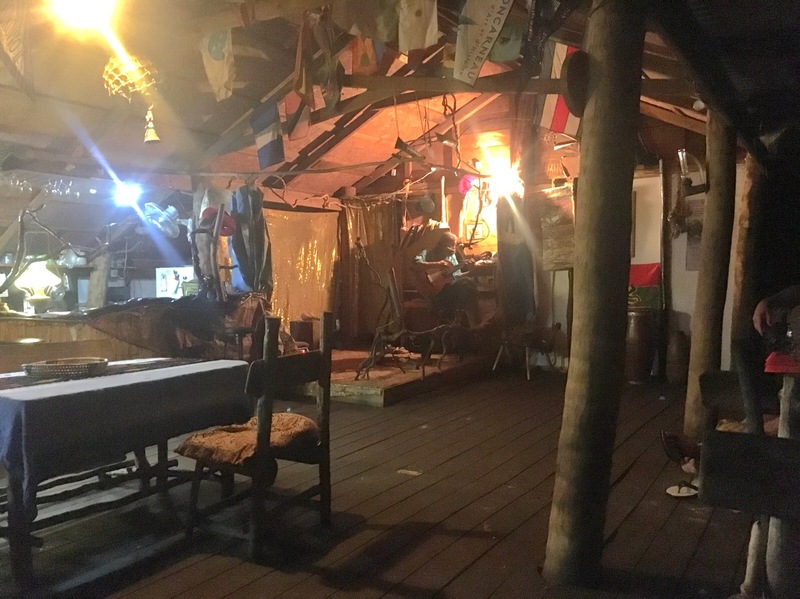 A Spanish couple have been running the restaurant ever since they moved to Tonga 26 years ago. Maria is a fantastic cook and served us six different Tapas, including a delicious Lobster salad, then bought us a large dish of Paella that been cooked over the open fire. As we were served a dessert of Raspberry sorbet two curtains were whipped back from a small stage in the corner of the room and the husband picked up his guitar and started to sing and play an enthusiastic rendition of old Santana numbers. He was really rather good but the scene was so surreal we started to giggle, just as we managed to regain a straight face, Maria stepped out on to the stage and joined in with the maracas. We could hardly contain ourselves, luckily I had a pole to hide behind but Rick had to muffle his smiles in his napkin. We have since learnt they used to have a pet goat who would also join in, I think we would have died. What a fantastic night.